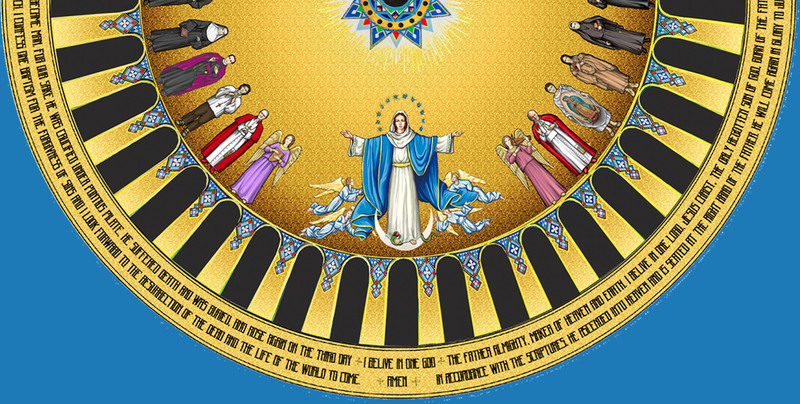 WASHINGTON – After nearly 100 years since construction began on the Basilica of the National Shrine of the Immaculate Conception, the placement of a final mosaic – inside the Trinity Dome – is expected to be completed in December 2017. The national shrine will mark the centennial of the laying of its foundational stone in 2020. The final mosaic will be the “crowning jewel” of what is known as America’s Catholic Church and is one of the largest Catholic churches in the United States. EWTN covers the Trinity Dome blessing at the Basilica of the National Shrine of the Immaculate Conception. Wyatt Goolsby, EWTN, goes behind the scenes to cover the a ceremony led by His Eminence Cardinal Wuerl of Washington, DC. and provides detailed information about the installation of the mosaic that will complete the original interior plan. Watch the Trinity Dome Press Conference with Cardinal Wuerl, Archbishop of Washington and Msgr. Walter Rossi, Rector of the Basilica of the National Shrine of the Immaculate Conception.